Exotic Blue is another of those astonishing irises that is stunning in its unusual simplicity. Perhaps one of the most out of the square descriptions I read was Lloyd Austin determination that 'Exotic Blue' was a kind of green and in fact 'Exotic Blue' was listed with the other 'Fascinating approaches to Green' classified irises in his catalogue (nearly two pages of this colour tone). This iris along with Burnt Toffee, Crimson Tiger, Infernal Fire, Millennium Falcon, Tiger Honey, and the Border Bearded Irises like Jungle Shadows, Batik, Network, and the surprisingly named Baboon Bottom, when they bloom at home always give me time to ponder the unstable genes that are always just below the surface in the Bearded Iris genetics. You can never beat the element of surprise! Keeps you grounded. Randolph Iris Garden, Ithaca, New York. 1958 Introductions. Lavender blue tinged with greenish brown. having a heavy matching beard which accentuates its exotic charm. 32". H.C. 1957. Runner-up for the President's Cup at the 1958 Annual Meeting. Bulletin of the American Iris Society, July 1959, Number 154, Part 1. Varietal Comment, Region 7-Nashville Vicinity, Adelaide D. Peterson, Brentwood, Tennessee. Exotic Blue (Randolph), more than just aptly named. This is a connoisseur's iris which almost defies comparison. Medium in height, with falls a bit narrower than are generally popular, it nevertheless is a type of color break that is a hybridizer's dream come true. Several shades darker than powder-blue, it has a dark blue, olive-tipped beard, an olive green area at the haft with 'purple veining deep inside. While most viewers here stood around it in awe, one irisarian thought it terrible. That's the way with this iris, you're likely either to admire it tremendously or dislike it entirely. Bulletin of the American Iris Society,October 1960, Number 159. 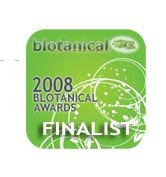 Varietal Comments by Region 15 Members by Thornton M. Abell, Santa Monica, California. A few things seen in the Los Angeles area before leaving for the AIS Convention in Portland. 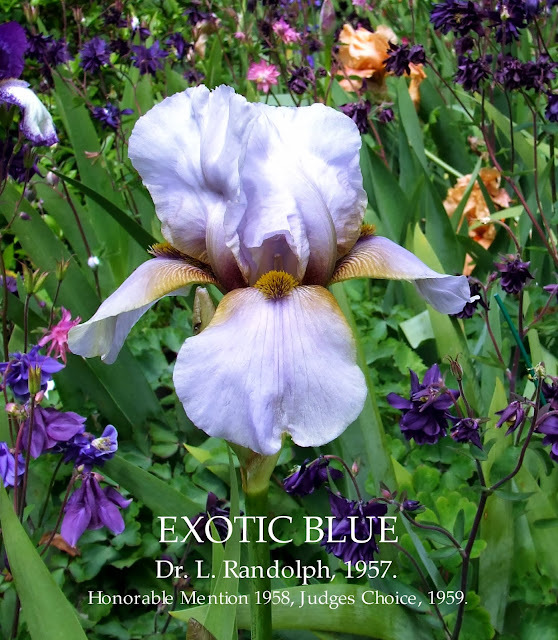 Also in Lura's and Barbara's gardens we saw Randolph's EXOTIC BLUE, a most intriguing flower, a smoky greenish blue with a rusty-violet beard; although somewhat narrow in form, it was effective. Rainbow Hybridising Gardens, Placerville, California. Lloyd Austins World Famous Iris Color Guidebook, 1963. EXOTIC BLUE (Randolph, '58) EM 34"
From our AIS President Dr. Randolph comes this hybridizer's dream come true. Of such spontaneous appeal it was runner-up for President's Cup the year it was introduced. Yes, it's exotic & quite different. A distinctive blend of lilac blue and greenish brown with a matching olive-tipped brown beard. A connoisseur’s iris that defies comparison. [(Mata Hari x Black Forest) x White Wedgwood] JC '59. The Iris Re-Christened SUNSET, The Garden 1922.